These cupcakes are to die for! A rich chocolaty cupcake stuffed with caramel, then topped with a buttercream frosting. Next, hot fudge and caramel sauce is drizzled over the top and pecans are added for the final touch. * shortening may be substituted for part of this ingredient (1/2 cup butter and 1/2 cup shortening) for a firmer frosting that works well in warmer temperatures. 1 Heat oven to 350°F. Place baking cups in your cupcake pan. I love these liners and this pan. 2 In a large bowl, combine the cake mix, buttermilk, oil and eggs with an electric mixer on low speed for 30 seconds. Beat on medium speed for 2 minutes, scraping the sides of the bowl occasionally. 3. Divide the batter evenly among cupcake liners. Bake 20 to 25 minutes or until toothpick inserted into the center comes out clean. Cool for 10 minutes, then move from pan to cooling racks. Let cool completely for 30 minutes. 1. In a large saucepan, combine caramels and whipping cream over low heat, stirring frequently, until the caramels are all melted and combined with the whipping cream. 2. Let cool for 5 minutes, then spoon mixture into medium resealable food-storage plastic bag; seal bag. Cut off tiny corner of bag. Twist bag above frosting. To fill cupcakes, insert tip of plastic bag halfway into cupcake center and squeeze until you see caramel start to surface. 1. Beat the butter until fluffy. 3. Adjust the consistency if needed by adding additional confectioners' sugar or milk. 4. Add an icing tip to an icing bag, then spoon in the frosting. Squeeze the frosting out of the bag onto the cupcakes in a circular motion from the outside of the cupcake to the middle. 5. Drizzle the tops of the cupcakes with the remaining caramel sauce and with chocolate or hot fudge sauce, then sprinkle with pecans. 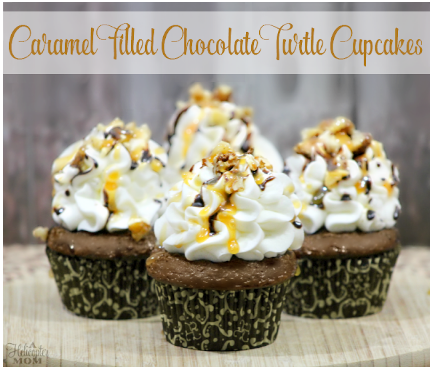 0 Response to "EASY CARAMEL FILLED CHOCOLATE TURTLE CUPCAKES"